A new user guide provides simple, cost-effective methods for stabilizing locally maintained slopes along roadways in Minnesota. Eight slope stabilization techniques are presented that local government engineers can undertake using locally available materials and equipment. These methods are the result of a research effort that analyzed recent slope failures in Minnesota. The recommendations are based on input from Minnesota county engineers; case studies from site investigations within the state; and slope stability analysis, including limit equilibrium methods. 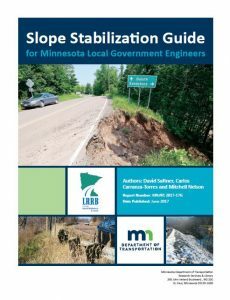 This guide is based on information provided in Slope Stabilization and Repair Solutions for Local Government Engineers, which presents the results of a Minnesota Local Road Research Board research project on slope stabilization methods. Detailed information about the research project along with complete descriptions of the field sites is available in the report. Local government engineers are encouraged to reference the report when using this guide.